Here’s a story that proves once again that if you fly too close to the sun, you’re inevitably gonna get burned: This kid who said he was old enough to bowl without bumpers just rolled eight gutter balls in a row, and now he’s crying in the back room reserved for parties. Sorry, kid, but if you can’t walk the walk, don’t talk the talk. 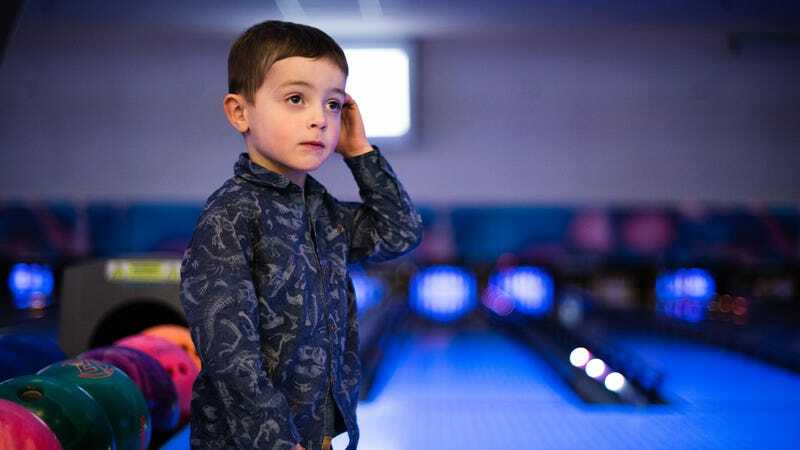 Arguing that he wasn’t a baby anymore and that he’d gone bowling enough times to hold his own at the sport without any special accommodations, 7-year-old Ryan O’Connor successfully convinced his mother before a family bowling outing today to let him bowl without bumpers for the very first time. However, after arriving at the bowling alley, it quickly became clear that Ryan was not as capable of a bowler as he claimed to be, as when it came time for his first roll, he picked up an 11-pound ball that he could barely carry, waddled over to the lane, and immediately chucked it into the gutter. Although he brushed this off as “a practice bowl that didn’t count,” things didn’t get any better for him moving forward, as he went on to rack up seven more gutter balls over his next seven turns, leading him to ultimately break down in tears and retreat to one of the party rooms in the back of the bowling alley to mope by himself. When his mom went to the party room to comfort him, Ryan refused to accept any responsibility for his piss-poor performance. He blamed the gutter balls on his bowling shoes not fitting correctly, even though it was obvious to everyone watching that his failure was the result of his lack of arm strength and his highly deranged bowling technique, which involves seizing the ball with his thumb, index, and middle fingers in a clawlike fashion and flailing his arm forward as hard as he can, making no particular effort to control the ball’s trajectory. His mom, understanding these mechanical flaws, then gently recommended that they raise the bumpers for the remainder of the game to make things easier. But this suggestion only upset Ryan further, compelling him to run off sobbing to the arcade area of the bowling alley, where he proceeded to dance along to the demo screen of Dance Dance Revolution for the next half an hour, believing he was actually playing. All in all, not a good look for a kid who was talking such a big game about his bowling abilities. Ryan is definitely learning a hard lesson today about the price of hubris, but chances are he’ll come out of this embarrassing saga with a better understanding of his own limitations. One of his classmates is having a birthday party at the bowling alley next month, so here’s hoping he can get his expectations in check by then and simply try to have a good time.